Seriously, who thought it was a good idea to schedule a 300 level biochemistry class at 8:00 am three days a week? Do you know what time that means I need to get up to get there on time? 5:30 am This might not seem like a big deal to some of you, but I don’t do mornings. I know, I know, I signed up for it. But only because I had to! So how did I start up my horribly early morning? With breakfast of course. I couldn’t decide exactly what I was craving, so I went with a little of everything. 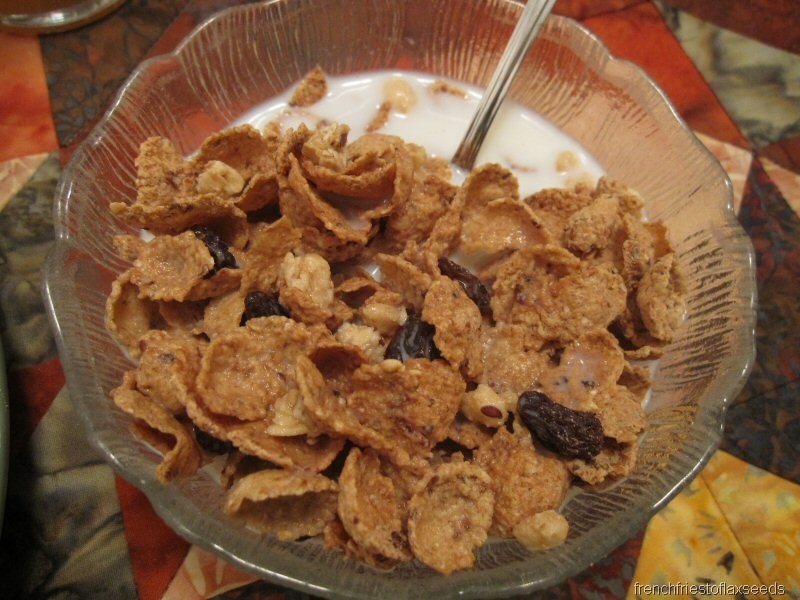 Starting with a small bowl of cereal – Nature’s Path Pumpkin Raisin Crunch. 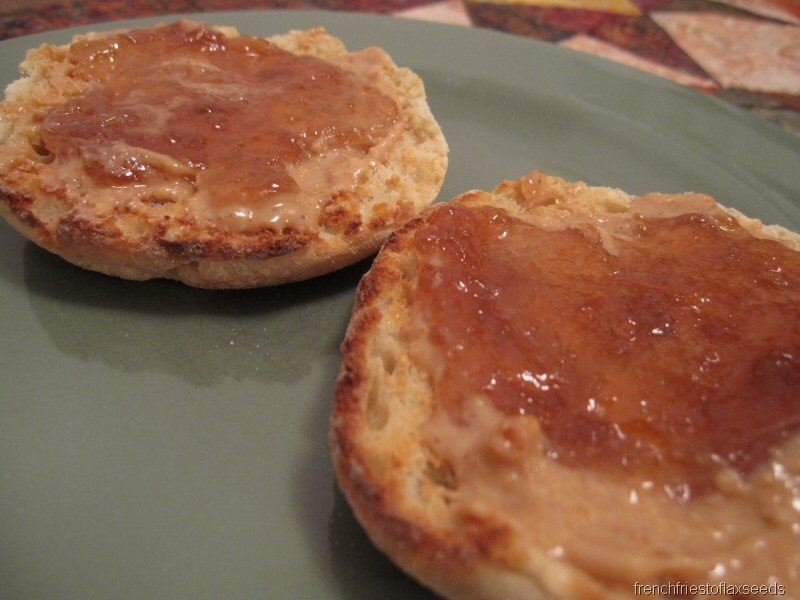 I also toasted up an English muffin and topped it with peanut butter and some rhubarb jam (made by my aunt) that I found in the cupboard. 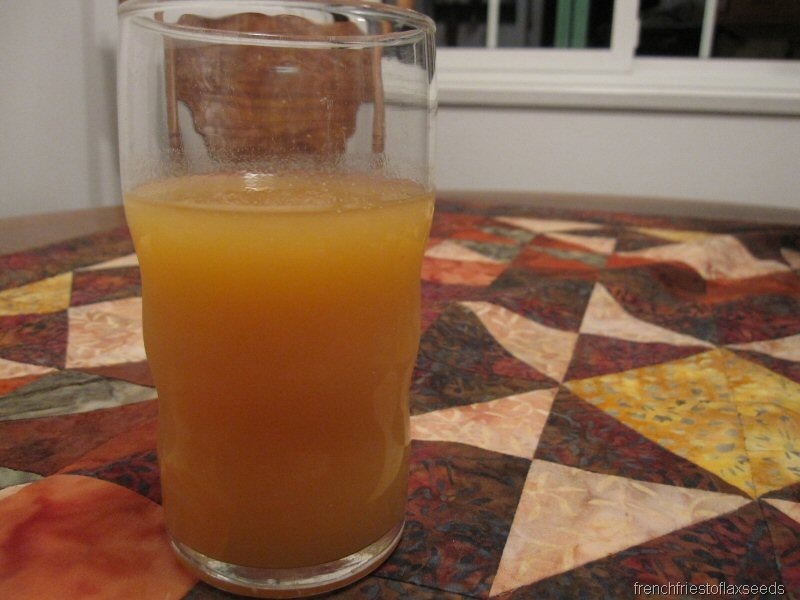 And the usual – Happy Planet Mango Peach Party. Dining before the sun comes up? Not my idea of a good time. It was a pretty good breakfast. I was a little disappointed in the rhubarb jam – it didn’t have any rhubarb taste whatsoever. I almost wonder if it was labelled wrong? Oh well, I’m sure it will get eaten up anyways. Can’t go wasting perfectly good food. My mom gave me a ride to the train this morning, and I actually ended up at school by 7:30 am. Oops! I also realized I forgot to fill my water bottle before I left, so I had to resort to buying a bottled water. Argh! Note to self – always make sure water bottle is full! Class was the usual first day – you don’t really learn anything, but get all the admin stuff out of the way. We were done at 8:50 am, and I was on my way home. 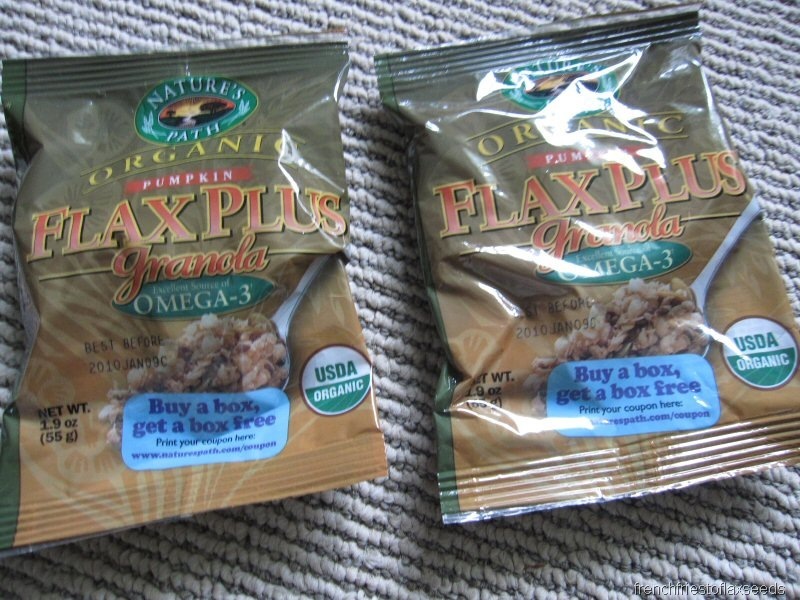 Scored some more free swag today too – this time, some Nature’s Path granola. Did I mention it was pouring with rain all day? It was gross – especially when you have to take transit. I so need to invest in a better rain jacket too. Anyways, I got back home by 10:40 am, and I was sleepy! Actually, I was hungry too, but sleep won out (especially when my internet failed to work), and I may have had a 3 hour nap. Tee hee! 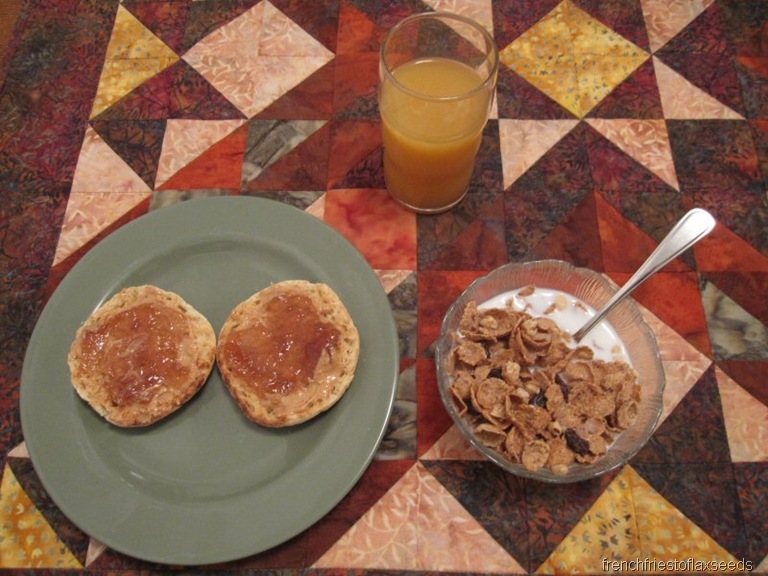 Once I dragged my lazy self out of bed, I was more than hungry, but didn’t want to ruin my dinner, so I made good use of my new granola samples. 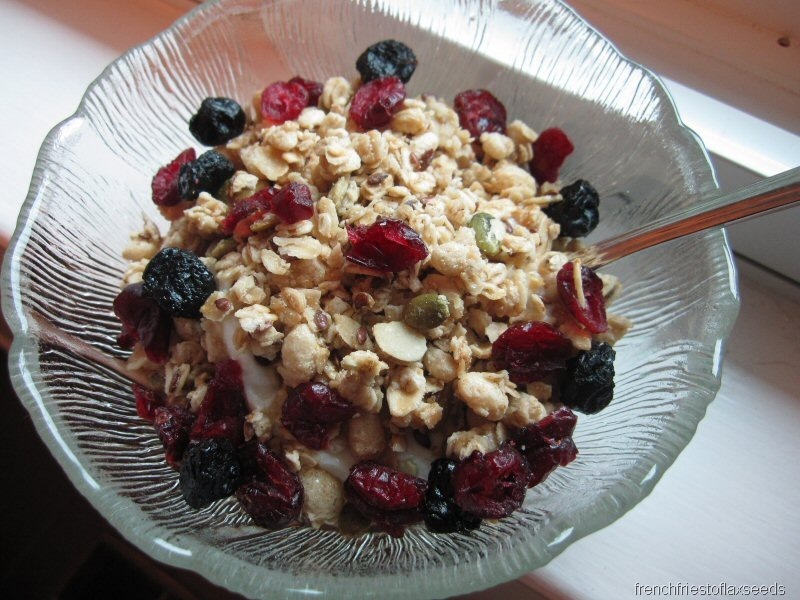 A bowl of plain, non-fat yogurt topped with some of the granola, craisins, and dried blueberries. It was a good tide me over until we sat down for dinner. Make your own sandwiches were on the menu tonight. Mine contained deli chicken, aged white cheddar, avocado, and ED&BV Lemon Cashew Basil Pesto on some toasted Silver Hills Squirrelly Bread. 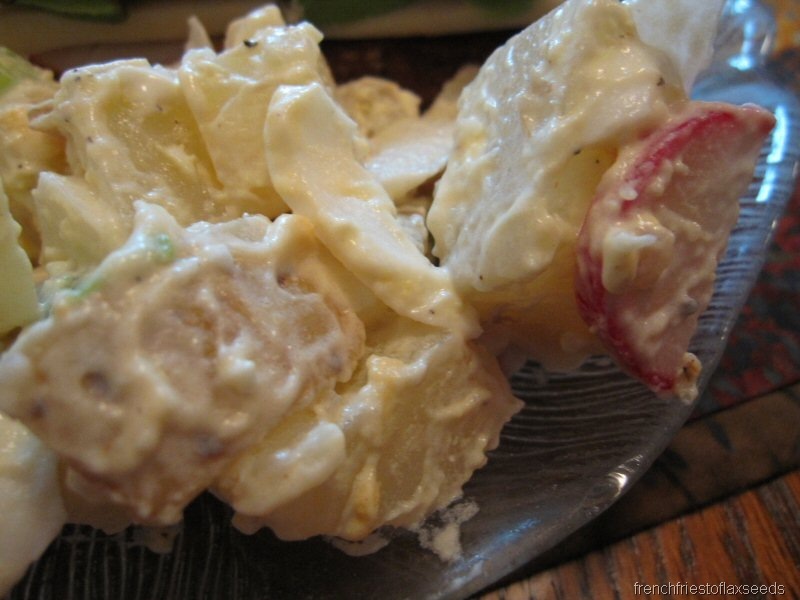 Mom made a quick potato salad. This time she left the jackets on the potato, and threw in some radishes for colour. 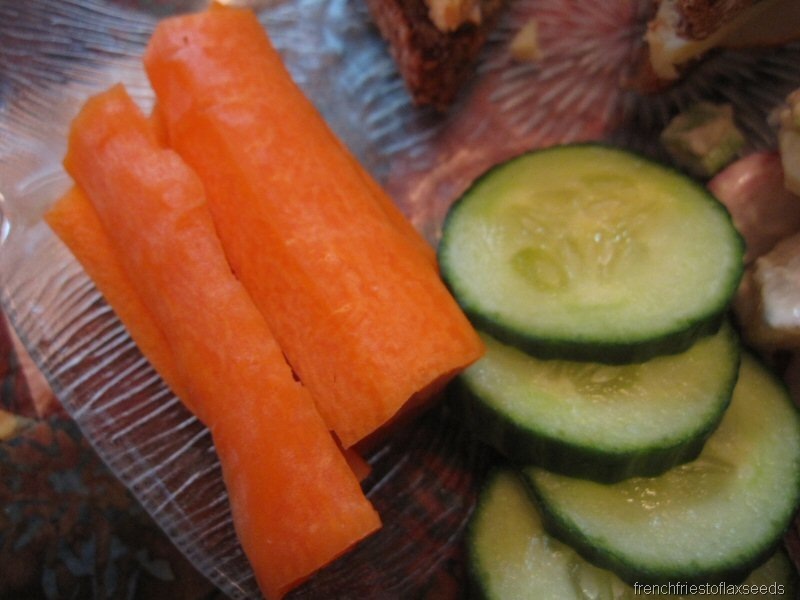 Rounded out with a few fresh veggies on the side – carrots and cucumber. Probably the best meal I ate all day! I actually had to do some readings this evening for a class that starts tomorrow – they only emailed us this afternoon. Thanks for the warning! It didn’t help that all the readings I needed to do were online, and my internet wasn’t playing nice. I managed to get most of them done. Fortunately, I have a 3 hour break before that class tomorrow, so I’ll get them finished at school. After dinner I met up with an old friend for coffee. I’ve known her since kindergarten. We even went to university together when I did my first degree, and had a ton of classes together (both biology majors). The plan was to hit up Starbucks, but she hadn’t had dinner yet, so we went to a restaurant instead. Although I could have used some caffeine, I ended up with a gin & tonic. LOL. And may have ordered some yam fries to munch on. I thought it would be a nice side, but it was a full on dinner plate full! I shared with my friend, because there was no way I was going to finish them all on my own. We had a great time catching up, and now that I’m back in the city, I’m sure we’ll get to see each other more often. Yay! Once I was home, I caught up on the shows I’d missed – SYTYCD Canada and ANTM – as well as a little blog reading. And writing you all this lovely post. Alas, this girl needs to get in bed now. Tomorrow (as well as Tuesdays) are my LOOOOONG days at school. I need to be on the bus by 7:36 am, and should arrive back at home by 7:30 pm. Ah, 12 hour days, 3 of which will be spent in traffic. Gotta love it! The good thing about early morning classes is that you get it over with (and can nap when you get home)! Boo to rain – it always seems to pour right when I’m outside! Good luck today – I predict some Sodoku during your commute?! My biochemistry class was at 8 am MWF also. Why do you have to wake up so early? Do you workout first? I used to get out of bed 40 minutes before class and throw on clothes and eat something really fast, then make my way to class! Like you, I would come home and sleep. I guess I would rather sleep longer than “really get ready”. 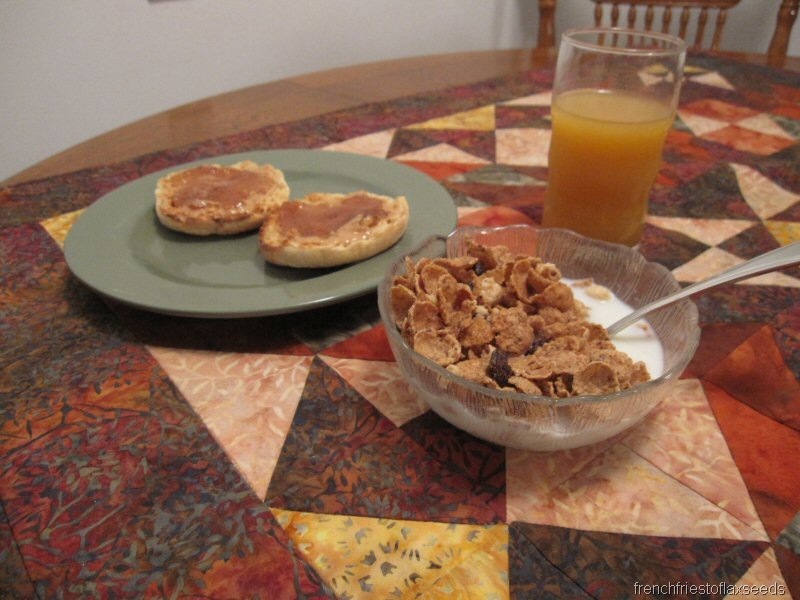 I always had breakfast though, no matter what!! That is definitely early, especially when you have to commute by train. I am a morning person, so I would prefer a morning class to an afternoon class. But 8 is earlier than it needs to be! I’ve started my classes now too. No going back now! A cruel joke! HA! Love that title. I was complaining about 930am classes 5 days a week in the Fall! But I have put in my time with early mornings after waking up at 4:30 and 5am so many years for skating!!! 5:30 am is way too early for me! On the bright side, free granola is always fun! You sure do have a long commute. I don’t envy you that. Isn’t catching up with buds the best? Glad you had the chance to meet up! 5:30…. three days a week?! You poor thing. I’d probably die just having to do that ONE day a week. Uck. And it’s not even like it’s a really exciting class that you’d be pumped to get to. Hopefully you’ll at least get used to the early mornings quickly…? ehe. your dinner looks delicious! that’s quite a sandwich! I made the mistake of scheduling 8:00 a.m. classes thinking I’d get done earlier in my day. 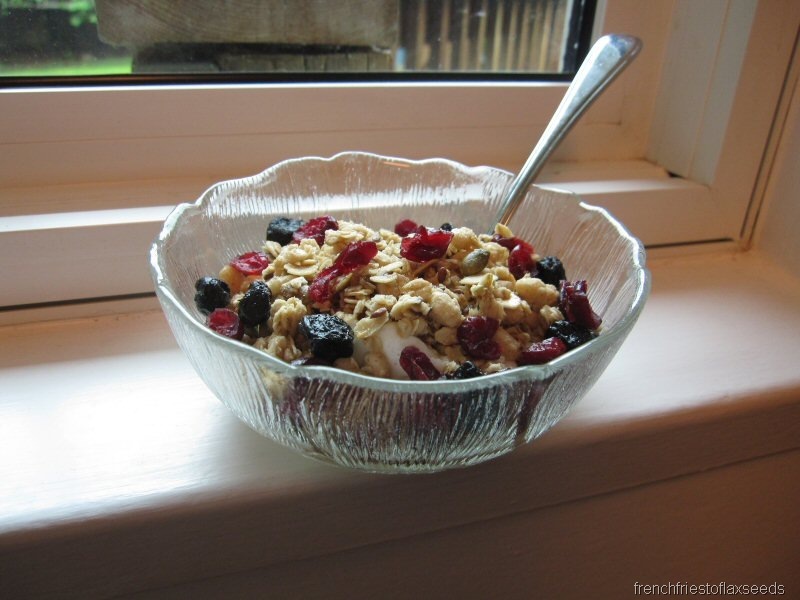 If you are not a morning person (I am not!) I missed half of the classes because I never got up in time! 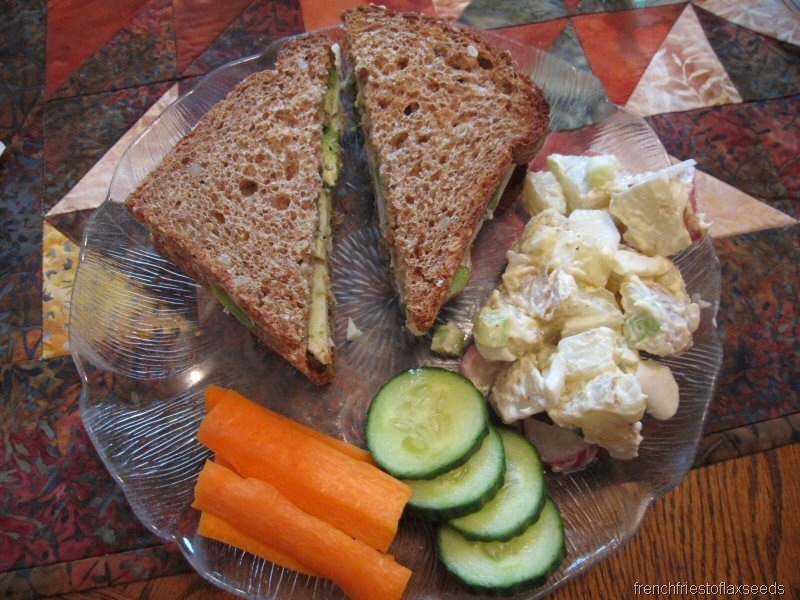 Love your sandwich – I have some avocado, I may need to make a sammie for my lunch tomorrow! uh i’ve been hating the early mornings to, but for some reason i get used to it quick. just think, it’ll be over before you know it! 🙂 hope it goes well love! I love the first week of classes for that reason–you have to go to class, but it’s usually over within a half-hour. Sweet. 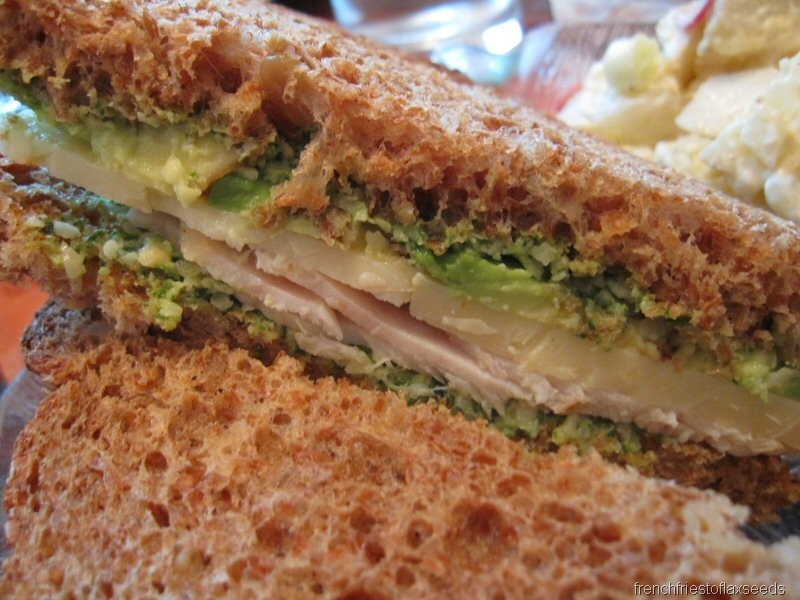 How clever are you for putting that phenom pesto on a sandwich?! Genius.